This auto loan rate comparison calculator will calculate a side-by-side monthly payment and interest cost comparison of up to 10 different car loan and term combinations. 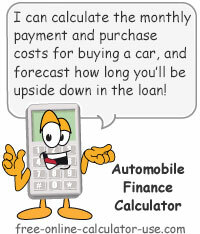 Plus, unlike other auto finance calculators, this car loan comparison tool will also calculate the number of hours you will need to allocate to working just to pay the interest costs of each loan included in the comparison. Finally, the calculator also generates an "Auto Loan Interest Comparison" graph and a button for creating a printer friendly report. 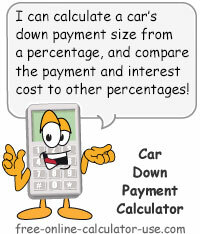 Calculate and compare car payments and interest costs for auto loans having differing number of payments and interest rates. 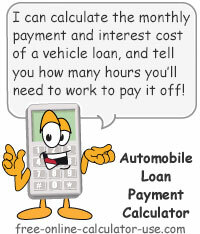 Enter the auto loan amount you wish to use for comparing the auto loan payments and interest cost. Enter as a dollar amount, but without the dollar sign and any commas. Note that you can change this amount later and the rates and terms you are comparing will automatically recalculate based on the new principal amount. Optional: Enter your real hourly wage (RHW is the after-tax, after work-related expense wage earned per hour devoted to working). Enter as a dollar amount, but without the dollar sign and any commas. If you do not know your RHW, click the link to open the real hourly wage calculator in a new window. Select the number of different term and interest rate combinations you would like to compare. This will display an entry row for each combination in the form below. After selecting the number of loans to compare, the Loan Combination List will be populated with the selected number of entry rows. Select the variable you wish to appear in the right-most column (Pmt = Monthly Payment, Tot = Total of all payments, Int = Interest cost through payoff, Hrs = Work hours required to pay the interest cost). You can change the 3rd column variable at any time. For each entry row in the Loan Combination List, select the interest rate (Rate) and number of payments (Term). At least 2 rows must contain values in the right-most column before the "Create Comparison" button will be enabled. To bulk fill the Rate or Term column, select the rate or term from the Fill All menu in the header row. You can then make changes to individual rows. Enter the amount of the auto loan you are considering. If you would like to be made aware of how many hours you will need to work to pay the interest charges on the loan, enter your Real Hourly Wage. If not, leave the RHW field blank. Select the number of different loan rate and term combinations you would like to compare. At least two will be required for the loan comparison report. For each entry row, select the interest rate and the term (number of payments). Tap the "Create Comparison" button. This will generate a Loan Comparison Chart, an Auto Loan Interest Cost bar graph, and a button for creating a printer friendly report. Regardless of your quiz results I think you will agree that interest charges are not something you truly want to purchase. So if you don't have cash to purchase an automobile, then here are some steps you can take to reduce the amount of the interest charges you will pay when borrowing for a car purchase. 1. Purchase a lower priced car. Purchasing a lower priced car means you won't have to borrow as much money, and a smaller loan will likely cost you less in interest charges. If you compare low, low-medium, medium-high, and high purchase prices using the auto loan comparison calculator, you will see what a difference price can make in the amount of interest charges you will pay. 2. Shop for the best auto loan rates. The time you spend shopping for the lowest car lending rate can typically save you more money than you could otherwise earn with the time spent. Use the compare auto loans calculator on this page to see how even 1/8th of a percentage point can make your research time well worth the effort. 3. Pay off the auto loan as quickly as possible. The sooner you pay off the loan, the less you will pay for interest charges. 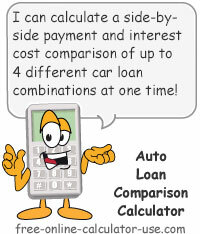 Use the compare car loan calculator on this page to see how much you will save by shortening the number of payments.